With the Multi-CB impedance calculator, you can calculate the approximate impedance dimensioning of your PCB / high frequency circuit board. These are pure estimates to obtain a guideline. The surface finish is neglected. For exact impedance calculation, we recommend the software from Polar Instruments. Caution: The results are only for approximation and rough estimation, the final values and the corresponding layer construction have to be calculated by us. Compliance with the impedance values is measured and logged by Multi-CB (impedance control). Instructions: Please select the value to be determined - this turns red and is calculated instantly. You can then adjust the other parameters according to your needs. 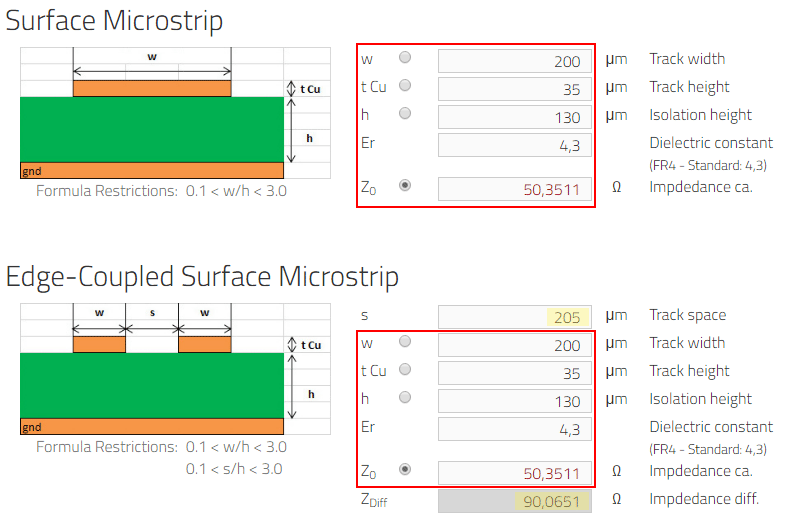 Calculate Z0 as normal Microstrip, until you get the desired value, e.g. 50Ω. Apply the values to the differential calculation, e.g. Edge-Coupled Microstrip. Z0 now meets your requirements. Adjust the distance "s" until ZDiff meets your requirements, e.g. 90Ω.